The honeymoon is over, a European regulator recently reportedly observed about renewables. A divorce? He was asked. No, he replied. It is a maturing relationship. Renewables have to show their benefit. We’re not going to do it simply because we love them. The main U.S. federal support provided to solar is the investment tax credit (ITC). Given today’s hard economic times, it is important to know if U.S. solar is returning the “love” the federal government is providing with taxpayer dollars. The ITC allows a tax credit equal to 30 percent of a project’s costs. After 2016, the credit will be stepped down to 10 percent. Supported by both the Bush and Obama administrations, the ITC has enabled lease and Power Purchase Agreement (PPA) financing mechanisms which, according to GTM Research’s most recent Solar Market Insight report, accounted for more than 63 percent of California residential installations and more than 80 percent of Colorado residential installations in Q1 2012. 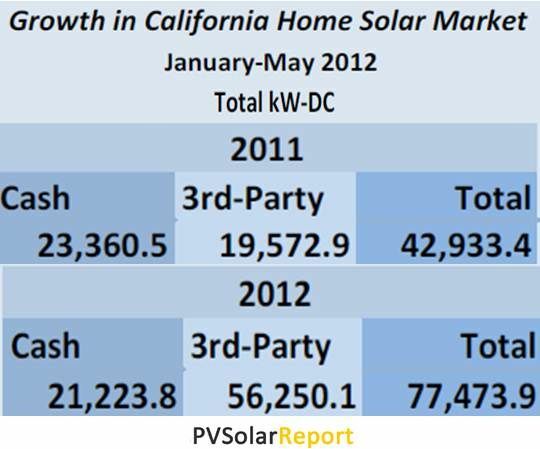 California, which represents 40 percent of U.S. solar, went from 42,933 total kilowatts installed in the first five months of 2011 to 77,473 kilowatts in the same period of 2012. But kilowatts installed with cash went down from 23,360 to 21,223, while kilowatts installed using third-party financing lease and PPA models nearly tripled from 19,572 to 56,250. 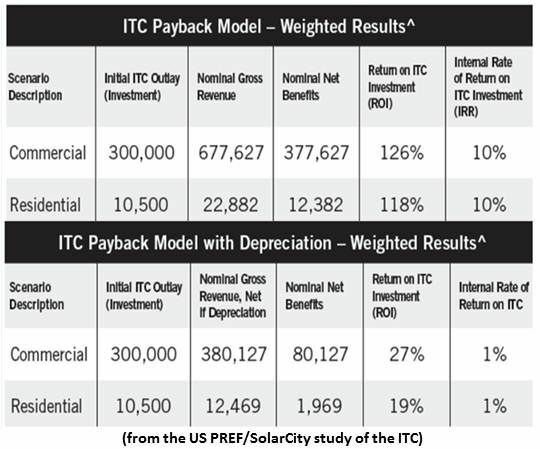 Paid in Full: An Analysis of the Return to the Federal Taxpayer for Internal Revenue Code Section 48 Solar Energy Investment Tax Credit (ITC), authored by SolarCity Structured Finance Associate Connie Chern and sponsored by financial coalition U.S. PREF, demonstrates that, over the life of solar assets installed in residential and commercial settings, lease and PPA financing structures can deliver a nominal 10 percent internal rate of return (IRR) to the federal government for its ITC investment. It is, SolarCity Communications Director Jonathan Bass said, “a fairly narrow look” at the IRR-generating revenues. It considers only taxable wages and revenues by the direct participants in the solar projects modeled: the developer, the commercial EPC or residential installer, and the energy user. “We’re not looking at all the external factors,” Bass said, such as those included in the comprehensive Job and Economic Development Impact (JEDI) calculator NREL uses to assess economic benefits of renewables. Including those, he said, could significantly increase the calculated ITC benefits. The study modeled a 200-kilowatt commercial project at an estimated cost of $1 million. The 30 percent ITC would mean a taxpayer investment of $300,000. The revenue returned from developer, EPC and owner taxes was calculated at $677,627, for a benefit above investment of $377,627. That’s a 126 percent return on investment (ROI), which, over 30 years, is a roughly 10 percent per year interest on investment. 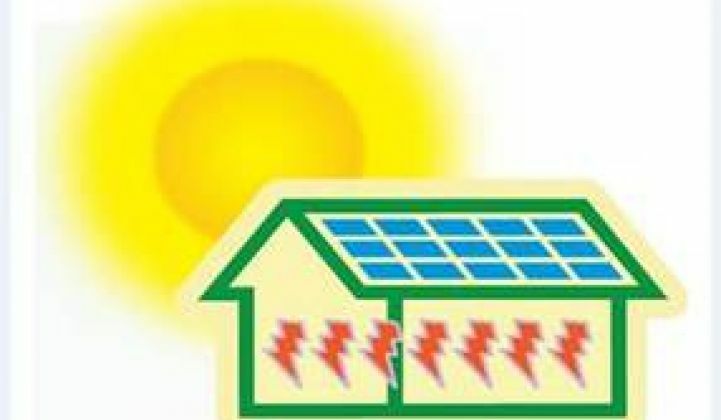 A five-kilowatt residential system, estimated at $35,000, would get a $10,500, 30-percent ITC. Total revenue would be $22,882, for a benefit of $12,382, a 118 percent ROI which, over 30 years, would also be an approximately 10 percent annual return. Because investors in the lease and PPA mechanisms typically do so to take advantage of the accelerated depreciation mechanism allowed by the tax code to capital improvement investments as well as the ITC, Chern also modeled ROI scenarios that included both tax breaks. Some 90 percent of the nearly 5,000-megawatt U.S. installed solar capacity was built after the ITC was increased to 30 percent during the Bush administration, Chern’s study reported from GTM Research and SEIA data. But incentives for solar energy, according to a University of Tennessee Howard Baker Center May 2012 report, are “less per megawatt-hour than for any other fuel source by a factor of ten,” despite the fact that “the solar industry has produced more jobs per megawatt-hour than any other energy industry,” Chern’s study also reported. Neither Chern nor Bass could say if there are comparable studies of the benefits from incentives provided to other energies. KPMG, one of the widely respected Big Four auditing firms, reviewed the study and found its income tax assumptions, incentive numbers, financial model architecture and mathematical formulas to be correct. With the solar trade war still a thorn in the industry’s side and the House of Representatives increasingly hostile to renewables, this research could turn a few important heads.